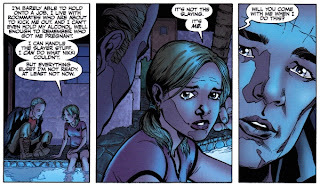 So Buffy Season 9 #6 happened. It got a bit of a reaction aka tons of major media outlets were all over it. That's both good and bad. It's great to see our girl in the limelight, but it's hard to swallow how politicized what's happening with her has gotten. If you didn't know, the end of the most recent comic concluded with Buffy telling Spike she was getting an abortion and that she wanted him to be there for her when she did it. Abortion is a topic not often genuinely dealt with in popular media, so there's been a very strong reaction from both fans and creators now that this part of the story is out in the world. We reached out to Scott Allie to see how he feels about the big questions floating out there. Here's what he had to say. BUFFYFEST: Scott Allie, who the frick is the father?? SCOTT ALLIE: All will be revealed soon ... Pretty soon. BF: In terms of Buffy's controversial decision to have an abortion, there has been surprisingly less backlash than we expected. But in terms of "backlash" or "polarization" how do you feel about people saying they wish Buffy showed her usual strength they've come to expect and decide to keep the baby or give it up for adoption? SA: I understand people having that feeling. I don't think I've actually heard anyone say it quite like that, but I'm sure it's out there. I think she showed a lot of strength in making the decision to have an abortion. I don't think this is an easy decision for any one. Whichever way you go with this issue, a person making their own decision about such a huge question reveals strength of character. BF: In TV history, abortion story lines are pretty rare. Joss has stated it's frustrating to be held back in that way, do you agree from a writing standpoint? SA: Stories are about characters making choices. Drama comes from characters making decisions that define them. Willow made decisions to slip more deeply into the world of magic, even when there were clearly self-destructive aspects to it, and that allowed Joss and his crew to explore ideas about addiction. Stories need to be able to tackle any choices that characters are faced with in their lives, and this is a big one. 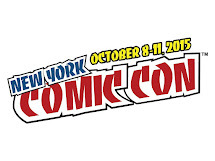 BF: The comic industry seems to be a bit more willing to delve into hot topics. 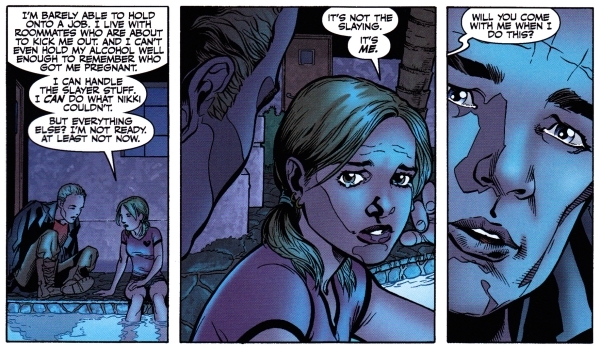 Do you think it's easier to handle Buffy's situation in a comic? Or are retailers as touchy about abortion as networks seem to be? SA: Oh yeah, definitely easier in comics. It's hard to broach this stuff under any circumstances, I did worry about retailers. The book came out on Wednesday and on Thursday I flew to Texas for a big retailer conference. But I got no negative feedback from the retailers. 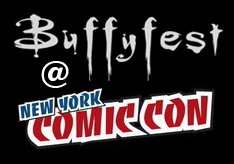 They remain very supportive of Buffy and of Joss. Whatever the case, these aren't easy stories to tell, but one of the things I love about comics is that we can tackle this sort of thing without the kind of interference we'd get if we were a TV show. We don't have to worry about our advertisers yanking their support, or the corporate entity coming down on us. BF: Any resistance from FOX? SA: Oh, right. No. None at all. Fox is a great partner for us on this stuff. They give Joss a lot of room to do his thing. No grief about Satsu, no grief about this. BF: How do you feel about comments accusing Joss and Dark Horse of simply bringing this whole subject up as a PR stunt? SA: That's ridiculous. 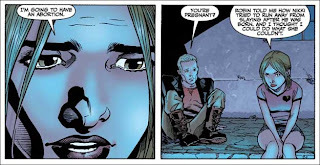 When the pregnancy was first revealed in #5, I saw someone post a comment that maybe Buffy would decide to get an abortion, and another reader said, "No, Dark Horse and Joss would never do that unless they want to sacrifice their cash cow," which I think refers to the divisiveness of the issue. Critics are better off accusing us of being political, to the potential detriment of PR. However, I don't think Buffy's choice is a political one, it should not be a political one, but a completely personal one. Unfortunately we live in a world where this very personal thing is heavily politicized. It shouldn't be. These are very personal, human matters, and that's exactly the stuff that artists should always be free to explore in their stories, without being accused of being partisan or some frigging thing. We didn't bring this up as a PR stunt. We brought it up because we care about the question, the difficulty of it, just like we care about friendship and gender and individual personal empowerment, and all these other human conflicts. BF: Buffy's decision seems to have come at a really interesting time with the Planned Parenthood controversy last week. Were you surprised by the timing? SA: Yeah, that was a big thing. That was surprising. I wish Planned Parenthood didn't have the problems they have. We live in a crazy world where people kill doctors, try to shame vulnerable young women, seek to block health care. BF: Besides Sierra Hahn, you are pretty much a boy's club over there. Was it intimidating to take on an issue that affects women first? 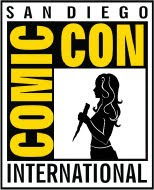 SA: Dark Horse has the best mix of men and women of any editorial staff in comics, something I'm very happy to be a part of, something I've put some effort into. We have seven women and eleven guys, which is probably a more balanced ratio than we'd see in our readership, so I think it's pretty good. We have women in key positions throughout the company, and it informs what we publish and how we publish it. Robert E Howard's stuff is generally thought of as pretty sexist, so I thought it was interesting to assign his Kull series to Sierra, one of the strongest women I know. Diana Schutz is handling all the Milo Manara material we're publishing, including the erotica series. When we were doing Green River Killer, I gave that to Sierra, and her point of view affected how some of the potentially exploitive content was handled. Freddye, Sierra, Rachel, all our female editorial, management, and marketing staff inform the vision that we present to the world. Compared to other entertainment companies we do a good job in terms of representing a balanced perspective. Was it intimidating to take on this issue? Would it have been nice to yank Jane Espenson in for an issue? I can see that, but Andrew knocked it out of the park, Joss had a heavier hand on this script than the last few. And as far as Georges goes, no one can convey so much behind Buffy's slightly furrowed brow than him. I believe this crew is coming from solid ground in terms of presenting Buffy to the world. BF: Where do other characters stand on the issue of abortion? Is anyone anti-abortion? How will Xander feel? SA: Um, on the one hand, that's not entirely what the story is about, on the other, I want to leave that to the story. BF: Are we to assume that Buffy doesn't know about Connor's existence? It's suggested in the issue that she's pretty much written off the possibility of a "Vamp Daddy" in any instance other than the breaking of the seed. So does she STILL not know that it's happened before? SA: She knows about Connor. I've had some questions about that—all the tricks of false memories and erased memories and all that from the course of the show ... for expedience, we're proceeding as though the characters have had off-panel conversations sharing general info like that. I would not want Season 9 to be about something that was concealed three seasons ago—it would distract from the forward motion of the story. I think it's pretty reasonable to assume these conversations have taken place. I know some people think that's lazy, or that we're skipping over potentially dramatic scenes, but we think this is the right way to go. BF: In fact, there is no mention of Angel at all in this issue. We know Buffy considers Spike as a possible father, should she even be considering Angel as a possibility at this point? SA: Gotta leave that for now. BF: Could Buffy be lying about knowing who the father is given that she was talking to Dawn at the time and Xander was uncharacteristically absent all issue? BF: Buffy's pregnant and Angel's book is dealing with "Daddy Issues". Is it a coincidence that both titles are dealing with the issue of parenting right now? SA: One of the most important things a person does in their twenties is to define themselves as an adult. In your teens, you rebel against your parents in certain ways, but in your twenties you have to define what sort of adult you're going to be, and often that's in terms of your parents. Are you going to become your parents, or are you going to become their opposite—or where in the middle do you fall? There's a concept called First Saturn Returns—Buffy is a little bit young to be there, but it relates to what she's going through, what Faith is going through, and it calls the idea of parenthood and one's own parents into the conversation. BF: You're now writing the next arc, are you excited or nervous to tackle the aftermath of this decision? BF: Any other comments you'd like to add? SA: I want to thank the readers who've supported the book over the years. And I want to thank everyone who's given us really great support with the latest issues. To everyone upset about it, I understand where you're coming from, I know this is a deeply personal thing, and I'm sorry if Buffy's decision alienates anyone. I respect where everyone's coming from, and that there are many ways to see this thing, not just two, not just the one from which those of us working on the comic come from. But that's why it's worthwhile story material, appropriate subject matter for a book like this. It's something that will and must be addressed at all kinds of levels in the culture. This is considered a political issue because of the legislative battle. But abortion it's not only a political question. It's a personal one, and so I'm glad that I work with Joss, and that he wanted to put this out there in this way. It's an honor to be a part of it. Every once in a while I feel like what I'm doing is worthwhile and taking some responsibility for the world I live in, and very often it's working on Joss's stuff that gives me that feeling. Thank you as always, Scott Allie! Hahaha basically! I'm pretty interested in this story line! Can't wait for all the upcoming issues! Killing babies is not health care. And why not choose adoption instead? Why is murder seen ad the only answer? Buffy always s liberal random but this may be a breaking point for me. Shame on everyone. I'm going to respond as respectfully as I can. I am not ashamed of considering abortion and contraception to be health care issues. I do not consider abortion to be "killing babies" because I do not have the answer for when life truly begins. No one does. We rely on our faith in religion and science to help us each understand as best we can when life begins but none of us knows for sure. It is to each individual to reach their own conclusion. That is why, in my mind, leaving the choice to the woman (someone who we can say, without question, is alive and sentient) as to the fate of her pregnancy is the best available. I will not be shamed for feeling that way. I'm implying from your comment that you believe a woman should not have the choice to abort. If that is the case, then I'm returning that shame to sender. Trying to force someone to live based on your code of ethics, ones that can not be empircally proven as correct for all is, in reality, unethical. I respect your right to believe what you do but I will fight you at every turn if you try to enforce your beliefs onto everyone else. Thank you Buffyfest for your interview. I am so glad that you asked these questions. Allie was evasive but at least we know we'll at some point know the identity of the baby daddy. Thank you also for bringing up Angel. I feel like he's the elephant in the room that no one is talking about. Great interview. It's pretty brave of Whedon & company to tackle the topic of abortion, and I applaud them for it. Current popular fiction stories address abortion with "Yeah it exists, but we won't do that," (see Twilight, Knocked Up, any other "oops I'm pregnant" movie / tv plotline). That's assuming writers acknowledge it as an option at all. I'm pro-life, but it's a comic baby, so whatever. "No fetuses were harmed in the making of this comic book." It just seems like such a cop-out. I was kind of getting excited about the prospect of Mom Buffy and Bitty Buffy, and now the storyline just ends. Boring. Wow. Been a Buffy fan since forever but I'm vehemently opposed to abortion. Having a really hard time swallowing this. Think I'm going to have to drop it. I could deal with pretty much anything, but tearing a kid apart? That's kind of where I draw the line. So good luck with your "bravery." Great interview! Except for bringing up Angel's name in. No, I don't think it's an elephant pregnancy. LOL I think Angel's sperm somehow has crossed the ocean and fell upon Buffy in the party as a golden rain -just like the Greek myth of Zeus and Danae...:D Come on, guys, the possibility of Angel as the father of Buffy's child is just ridiculous! Please, let B/A relationship to rest in peace! Anyway, thank you for doing these interviews! Bitsy, I do agree with your comment.That's her body, she will decide what to do with the fetus. And it's not a exactly a killing if you remove the fetus during the first 3 or even 4 weeks. The fetus has no pulse, no heartbeat and blood-pressure (that's why Spike couldn't smell it, IMO), practically it has no soul yet. But I think Buffy will change her mind and will keep the child. I have to admit I didn't like the Buffy's pregnancy storyline before, but after this issue I want her to keep the baby, whoever the father is. Actually the child will HAVE a father, the best father in the world and his name is SPIKE!